Rain. Low near 55F. Winds SW at 10 to 20 mph. Chance of rain 90%. Rainfall around a half an inch. LOUISVILLE, Ky (WDRB) -- A Louisville homeless veteran is getting a second chance thanks to dozens of volunteers and some hard work. 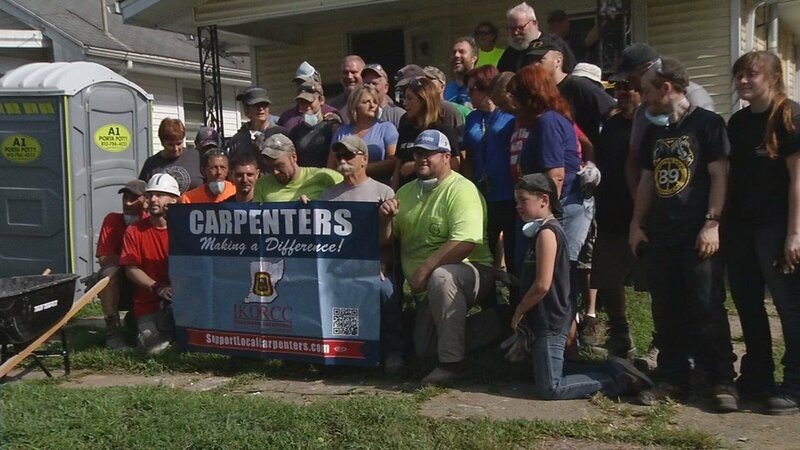 Saturday, more than 30 volunteers with the help of local unions, United Metro Way, and the Kentucky Department of Veterans Affairs, not only gave a home a second chance, but also the veteran who will be living there. “Our service men and women do so much for us here in Louisville Kentucky and all across our nation that we want to make sure that we gave back and honored them and honored their service and their sacrifice,” said Timothy Morris, with Greater Louisville Central Labor Council. The home is located on Clara Avenue near Churchill Downs. Housing partnership Inc. and Affordable Housing Trust Fund bought the Clara Avenue house through an auction. Many homeless veterans join apprenticeship programs with local unions to learn how to assimilate back into the workforce. Operation Victory helps with that. “There are a lot of veterans in our unions. There are several programs that actually lift up a lot of the folks that actually come back from the military service,” Morris said. The two bedroom house will soon be a three bedroom, with everything brand new from the floor to the ceiling. Volunteers will continue to work on the home throughout the summer and it’s expected to be complete in the fall. A new owner has not been chosen yet because applications are still being accepted.